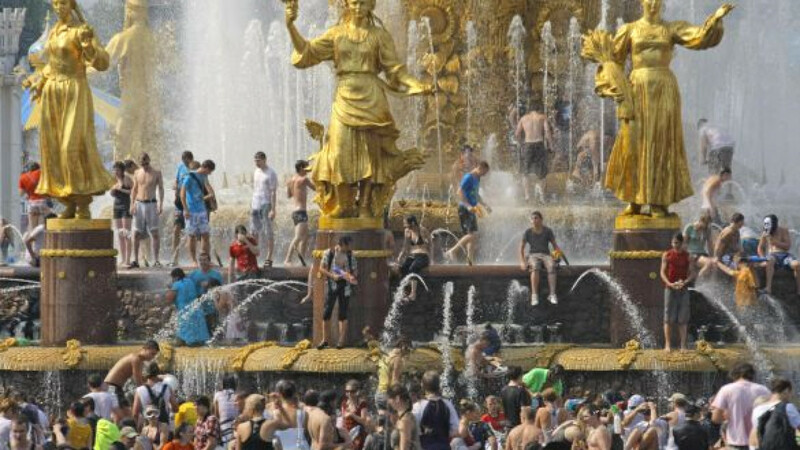 Moscow weather broke the record for July temperatures, set in 1936, by reaching 36.6 degrees Celsius, just two decimal points short of the all-time record, on Friday, weather forecasters said. Moscow is expected to break the absolute record of 36.8 C, set Aug. 7, 1920, when temperatures top out at about 40 C this week. For the next seven days starting Monday, temperatures will hover between 31 to 39 C, despite partly cloudy weather in the daytime and rainshowers at night, Metronovosti.ru reported. The worst trial is expected to come Wednesday and Thursday, when temperatures are forecast to reach 38 to 39 C.
Relief should come next week. On Aug. 3, the temperature will plummet 9 degrees to 24 C and stay at that level for several days. Last weekend brought some rainstorms to Moscow, and a girl was killed Saturday after being struck by a tree uprooted by strong winds in the town of Shatura in the Moscow region, Itar-Tass reported. But the rain will not wash away the dry and hot weather, meteorologist Anton Rodionov told Itar-Tass on Sunday. Moscow trees have begun to shed their leaves from dehydration, and the grass has dried down to straw. Thirteen people drowned in the city's pools and rivers on Friday and Saturday, Interfax reported, bringing the total number of people who have drowned in Moscow since the official start of the swimming season on June 1 to 147. The heat is made worse by air pollution, which was 1.5 times above the normal level Thursday, Alexei Popikov, senior official with the city's environmental watchdog, told Interfax, adding that peat bog fires were partly to blame. Smog from peat bog fires reached the Presnensky district and Sadovo-Kudrinskaya Ploshchad in the city's center on Thursday, Interfax reported. The smog has also blanketed the city's southeastern outskirts, including Ryazansky Prospekt, Volgogradsky Prospekt and Shosse Entuziastov, as well as the Moscow region towns of Reutov and Balashikha. The Emergency Situations Ministry said Sunday that it had extinguished all but one of the 38 new peat bog fires that started in the Moscow region on Saturday, Interfax reported. RIA-Novosti reported on Friday that Russia's chief sanitary inspector, Gennady Onishchenko, had recommended that traffic police officers who work outside in the heat all day should trade their pants and shoes for shorts and sandals.